Scientific Name(s): Pulicaria dysenterica (L.) Bernh. Photographer(s) Appreciation: Thanks once again to marianne aka marcella2/tovje@Flickr for sharing one of her images from The Netherlands. Pulicaria dysenterica was shared via the Botany Photo of the Day Flickr Pool. Last Friday, the UBC Horticulture Training Program students were treated to a lecture about Eurasian medicinal plants and a tour of the physic garden with Ukrainian botanical pharmacologist Anastasiia Dushyna. Pulicaria dysenterica was not one of the plants highlighted on the tour, but it likely would have been, had we been growing it in the Garden. 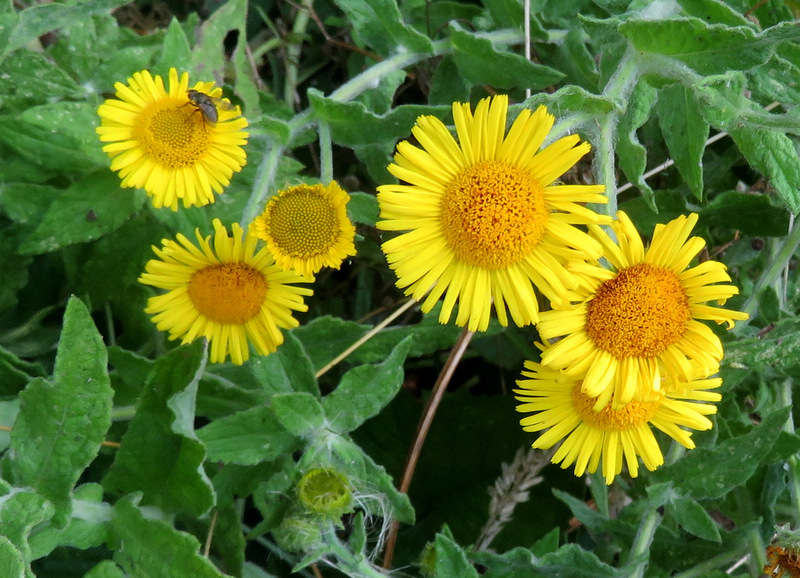 Known as common fleabane or meadow false fleabane, the base of its common names are an echo of the generic name. The Flora of North America entry for Pulicaria provides the derivation: “[Latin pulex, flea, and -aria, pertaining to; alluding to use of the plants as flea repellent]”. Several species within this genus of 70 or so species are indeed known to have insecticidal properties, purportedly as incense (via Wikipedia). I’ve only found a few references to Pulicaria dysenterica being used for this purpose, but there are many references to this species being used as a treatment for dysentery and external wounds and bruises. Pulicaria dysenterica is widely distributed across Europe, Asia, and northern Africa. As noted in the Online Atlas of the British and Irish Flora, Pulicaria dysenterica is a “herb of damp or wet, open habitats including marshy places, water- and fen-meadows, tall-herb fens, by rivers, streams, canals and ditches, in dune-slacks, wet hollows and seepages on sea-cliffs, damp woodland rides and roadside verges”. Additional images are available from the Flora van Nederland. Pulicaria was also the name of a plant mentioned by Theodorus Priscianus who wrote of medicine in the 4th century AD. It was a member of the genus Plantago that produced psyllium – ψύλλιον in Greek, ψύλλα meaning flea. Some Plantago species are still called fleawort or in French pulicaire. This seems to be from the resemblance of the seeds to fleas rather than any flea-deterrent effect. The female conyza of the Romans and κόνυζα of the Greeks was probably a plant now in the genus Pulicaria. The male conyza was probably the very weedy and stinky Dittrichia viscosa. The name is the feminine form of pulicarius, which can mean “of or belonging to fleas, producing fleas, flea-bearing” according to the Lewis and Short Latin. I am now too itchy to continue. Lewis and Short Latin Dictionary, of course. I shall have to look out for this when I am in the Netherlands again! It’s certainly a cheerful, and presumably easy-to-spot plant. Unfortunately, I’m usually there in May or June, and July is listed as when it blooms. Got my doubts about its usefulness against dysentery. The Wikipedia entry says that dysentery is a generic word for inflamed bowels, severe diarrhoea and cramping, and that it can be caused by bacteria, viruses or parasites. Mind you, I don’t blame anyone afflicted for trying anything as a possible cure, in the days before decent medicines. With antibiotics and other effective cures now available, I suspect this claim will remain in the realm of untested folklore. PFAF.org gives it a medicinal rating of one out of five. Meaning that it has some properties that may be useful to a small degree, but not how. It is astringent, but I don’t know if that quality would make it through the digestive system to ease the effects of dysentery. Astringency is not the same as anticholinergia, and the latter is what one would want. Perhaps a decoction or a tincture of Pulicaria dysenterica would be useful in reducing the histamine response of insect bites topically. Not at all suggesting, but curious. What is relevant for us, perhaps, is that with increasing awareness of the properties of diverse plants we may find greater benefit than simple delight at their existence. How and why is this plant astringent, how and why do sequoia grow so tall, can we recreate the strength and flexibility of mussel shell byssus, what can possibly live in the hydrogen sulfide spewing ocean vents?